You Can Support the Library With Music and Desserts Next Month. 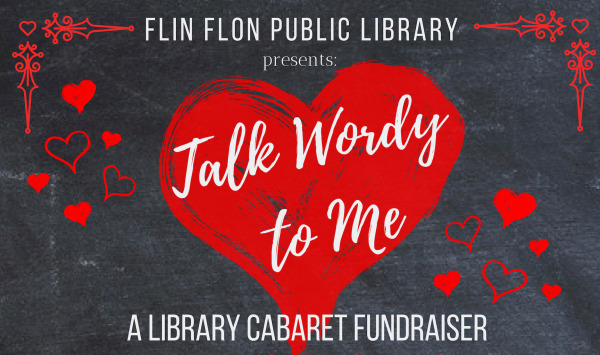 The Flin Flon Public Library is presenting Talk Wordy To Me: A Library Cabaret Fundraiser next month. Their Administrator Courtney Campbell says they’ll feature a lot of local performers as that’s what people really loved about it last year so they’re featuring a lot of the people who perform at Johnny’s and at the Local Roots concerts and they’re really excited about that. She adds they’re going to have some of the same things they did last year, there’ll be a dessert bar, raffles, a photo booth, lots of fun to be dancing and doing stuff like that. The Library Cabaret runs from 8 to 12 Saturday February 16th in the Flin Flon Community Hall with tickets available at the Orange Toad, Northern Rainbows End, the Gateway and the Library for 20 dollars.